Mobile ad network Millennial Media, is releasing its monthly report which gives a view into how each OS, device and manufacturer is performing on one of the largest remaining independent ad networks in the world. In August, Millennial actually combined connected devices and smartphones when breaking out the OS impression share. That’s significant because iOS and Android share can include tablets into factoring presence on the network. And last month, Android was in the top spot with a 54% share, while iOS was in second with a 28% share. Rim followed with 13% share. In terms of growth, Android impressions (including both phones and tablets) grew 48% month-over-month globally. iOS impressions were relatively flat month-over-month, and interestingly Windows Phone 7 impressions saw major growth and increased 48% month-over-month. Smartphones grew 6% month-over-month and took 72% of the impressions in August. 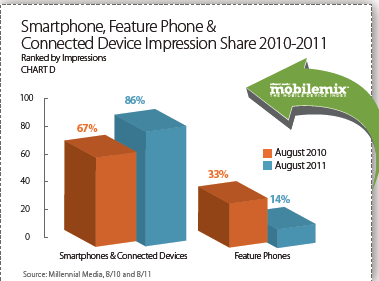 Connected Devices and Feature Phones were tied with 14% of the impression share. In terms of impressions by type of connection, 32% of impressions came over Wi-Fi. Of these WI-Fi impressions 59% came from Smartphones (as opposed to connected devices or feature phones), and saw an 11% growth month-over-month. Connected Devices, including Tablets, gaming devices, and eReaders, accounted for 34% of the Wi-Fi impressions on the network. In August 2010, feature phones accounted for 33% of Millennial’s network impressions, and this number has dropped to 14% in August 2011. 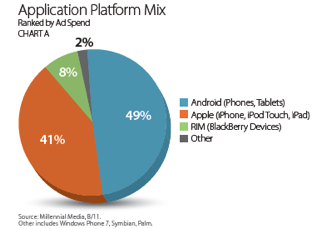 Millennial also breaks down ad spend from applications on the network, and in August Android grew 2% month-over-month and represented 49% of the Application Platform Mix. iOS followed with 41% share, with RIM taking a 8% share. In August, News applications on the Android platform grew 26% month-over-month. Gaming applications have been the number one Application Category on Millennial’s network for over a year and in August, games represented 25% of the applications impressions, a 19% increase month-over-month. Music & Entertainment application impressions grew 13% month-over-month and within the Music & Entertainment category, radio applications accounted for more than half of the impressions in August. Similar to July’s findings, Apple continued to be the leading device manufacturer the network in August, representing 23% of the Top 15 Manufacturers impression share. The iPhone maintained the number one position on the Top 20 Mobile Phones ranking with 13% of the impression share. represented 32% of the Top 20 Mobile Phones impression share in August. The past year has represented major growth for Millennial Media . The company just announced that 2010 revenue was $47.8 million, which is up over 3,000 percent from 2007 revenue of $1.5 million. And we know CEO and founder Paul Palmieri has had ambitions of taking the company public. In May, Bloomberg reported that Millennial was talking to bankers about an IPO, which could come in the Fall or in early 2012 and would value the company at a whopping $700 million to $1 billion (AdMob was sold to Google for $750 million).